Everyone knows exercise is good for health. And you want to start a workout routine and wish it were a habit. You start jogging, do it for two weeks, and you are back to normal life. Don’t worry; it happens to everyone. But it doesn’t mean that you are destined to live your life wishing away. To make any change in your life and make it permanent, you have to want it bad enough. Anyone can tell you how to do it, but to make a real lasting change, you have to make a decision. If you have read Napoleon Hill’s famous book Think and Grow Rich, he says, to achieve any desire, first and foremost you should have a BURNING DESIRE. It is the knowledge that how you want your life to be, that changes your habits. 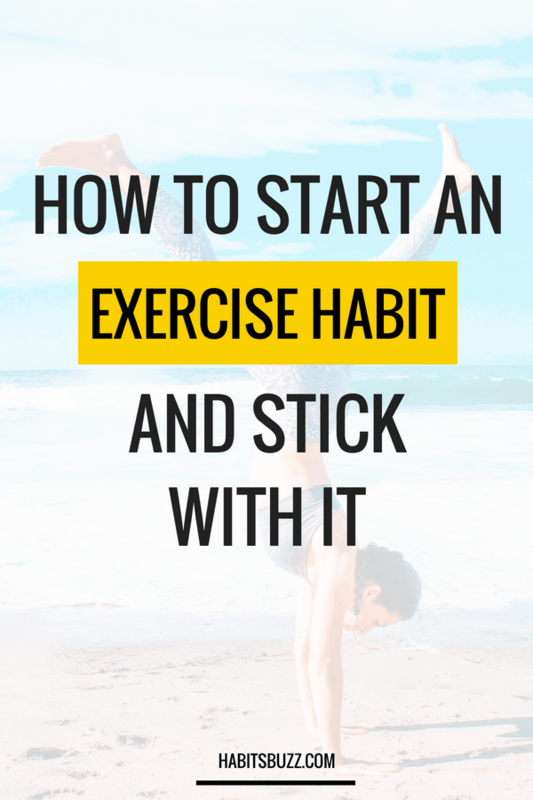 So here are 10 tips to create an exercise habit and stick with it. When you want to create a new habit, it is helpful to link it with any existing habit of yours. In The Power of Habit, Charles Duhigg talks about how habits are formed. There is a cue-routine-reward cycle to any habit. If you link your new work out habit to any existing habit, your old habit is your cue. Find your own best time to do exercise, morning or evening. And link your new exercise habit to any of your morning/evening habits. For example, you brush your teeth every morning. You can decide to do your workout straight after brushing teeth. Or if in the evening, maybe after you come from work. Find out what time works best for you. 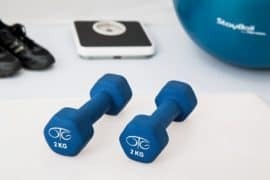 Linking your new exercise habit to an old habit works because the old habit is more established and therefore your brain has a strong neural connection for those habits. This method is called habit stacking and has been mentioned by authors like BJ Fogg, SJ Scott etc. When you are creating a new habit, always remember to start small. Your aim is to create a new workout habit and make sure to stick with it. In the beginning, what you should focus on is, building consistency rather than reaping benefits. Starting small will help you in showing up every day. This is a way for you to tell your brain that you want to make this a routine and your brain will start building new neural pathways. As you perform the routine more often these neural pathways will get reinforced and rewire your brain, creating a new habit. These are some examples, but of course, you can change the duration or repetition according to your ability. You have more chances of doing exercise, or for that matter, any habit, if you have scheduled a time for it in your day. If you are thinking to yourself, “I will do yoga tomorrow morning”, chances are you will postpone it. Because you know you want to do it, but don’t know when. If you think, ‘I will do yoga tomorrow morning at 7 am’, I bet you will do it. So grab your planner, (or whatever scheduler you are using) and block time for your workout. I use my bullet journal for scheduling everything. You must be having an idea about what results you want from your daily exercise. It could be weight loss, more energy, toning your abs etc. Make a plan to achieve your goals. Decide what kind of workout will excite you and will give you the results. It could be yoga, gym, swimming etc. or a combination of different exercises. Whatever it is, decide what your exercise routine is gonna be. If you want to tone down your abs, find 5-10 exercises that will help you achieve that ( Youtube and Pinterest have lots of information on this ). If you want to increase strength, find some strength training exercises. Same with cardio, pilates etc. Deciding what to do, when to do and how to do them are important because you get a well thought out plan. Your brain knows what you exactly want and that makes you stick with your exercise habit. You can’t reach your destination if you don’t know where you are going. Having an accountability partner does immense help in achieving your goals. They help you stay on track and cheerlead you when you are feeling down. Having an accountability partner works because human beings generally do not like disappointing others, especially the people they like. We might postpone and act lazy when we are unmotivated. But the thought of answering to someone if you don’t do it is embarrassing for us. So we do them anyway. I hope you get me. When we embark on achieving something, there will be moments when you don’t feel like doing it, or life throws you something, or you feel you are not doing a good job (we are our worst critics), you will need someone to pull you up, and help you get back on track. Yes, forming a new habit may not be that easy. But when you think about the end results, you are sure it is worthy. You can make anyone you trust to be an accountability partner. It could be a close friend, spouse or someone you look up to. Having talked about accountability partners, joining a fitness class or a gym can itself hold you accountable. You are paying for it, and you know you are bound to show up no matter what. If it is nearby your home or workplace, the better. Let not the long commute put you off. 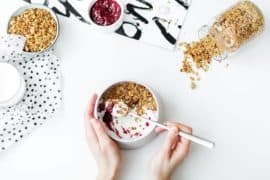 To stay motivated to stick with healthy habits, social media channels like Instagram and other search engines like Youtube and Pinterest help me a lot. I follow a few fitness and healthy eating enthusiasts on these media. So checking social media once in a while reminds me of my goals and aspirations. And it inspires me to achieve my fitness goals. Well, now I know social media can be put to good use also. Now don’t kill yourself when a slip up occurs. Nor should it be a reason to skip the habit altogether. But what to do when life happens? Even if you miss one or two days, get back into your routine the next day itself. If you miss more days deliberately, it means it’s gonna escape you. If you have an emergency to tend to on your exercise hours, take care of it. See if you can schedule it for a later time during the day. If you were to go to the gym in the morning and couldn’t make it, maybe you could go in the evening or go for a walk in the evening. James Clear often talks about sticking with habits each day in small ways. Missing one day’s workout is not gonna make you fat. But it is the cumulative effect that will make you skip the habit altogether. You can’t let it happen. Just stick to the plan, even if it is in the smallest way. If you are gonna miss a workout, at least do the warmup or some stretches. If you were planning to walk for an hour, walk around the block for 15 minutes. Whatever you were intending to do, you can do the smaller version of it. This lets your brain know that it is important to you. And thus the process of rewiring occur. After a while, you will find that you don’t feel like yourself when you skip a workout. Creating a new exercise habit can be hard, especially in the beginning your mind and body try to resist the change as much as possible. 30-day challenges are a good way to start an exercise routine. It starts small, you can track it and you stick with it for 30 days. It motivates you to not miss a day because you have a deadline. When we have a deadline, we tend to perform better. It creates pressure and forces us to show up every day. Though you will be getting the benefits after 30 days, don’t stop there. It has given you a head start for your lifelong fitness journey (hopefully). You can google and get numerous challenges that focus on each body part or even full body workouts. Pinterest is also a great resource for this. Try to incorporate different kinds of physical activities into your exercise regimen. Because it keeps exercise interesting and enjoyable. You are not stuck with one form of exercise. Experiment with different types and find out what you enjoy most and gives you good results. If Mondays are for yoga, Tuesdays can be for weight training, Wednesdays for jogging etc. You get the benefits of different forms of exercises and kick out boredom. Of course, trying everything at once is not advisable. Take it slow. Keeping a workout journal helps you track your progress. It inspires you to look back on how much you have achieved and to keep going. It keeps you on schedule. The thought of not able to cross off “workout” in my bullet journal makes me do my workout no matter how lazy I feel. You perform better when you have to answer to someone ( in this case, your journal). 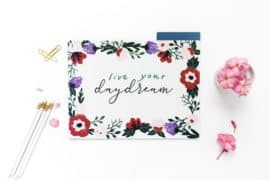 It creates a sense of accomplishment and builds my self-esteem when at the end of the day, I can mark it in my bullet journal. You can record your fitness goals in the journal and track them daily. It helps you to measure your progress. Your aim is to start an exercise habit. Thus, you might be starting small. You might not see the results on your body yet. But remember, first we wanna make this habit stick. Reward yourself for the efforts you are taking to make this change in your life. No matter how small, if you are making changes to create a better life, you deserve to appreciate yourself. So often we quit soon because we fail to see how far we have come, even if they are baby steps. Here is an article to read on how to reward yourself after a workout. Like any habit, creating a workout habit requires time, patience and a lot of effort. Workouts are not always easy and fun, but they are always worth it. Like I said, after a while, you get used to the adrenaline rush which will make you crave for the workout and then it becomes part of your daily life. So what more tips would you add to the list? Please comment below.